Today is Sarah Jean Alexander’s pub day. It’s the happiest day of my entire life, so I decided to tell you the story of how this day happened. I also decided to put Wildlives on sale for $9 for the next two days. If you don’t have it yet, now would be a cool time to buy it. 2. When I got home from Buffalo, I immediately emailed four authors and asked them for manuscripts. Two said yes, one said “maybe one day!,” and the other—the first person I thought of—told me at AWP that they are 95% sure that they are going to send me their book in 2016. 3. I had contacted these four people before I even knew how much an ISBN cost. 4. I held my first open reading period in October & November of 2013. I received 45 submissions on the first day, and ended up with 261 unsolicited submissions by the time we closed. 5. I had to say no to a lot of people that I loved. There were a lot of books in the pile that were great. Two really stood out and were accepted by other presses: Seth Landman’s Confidence and Morgan Parker’s Other People’s Comfort Keeps Me Up At Night. I am very happy that these books exist. 6. 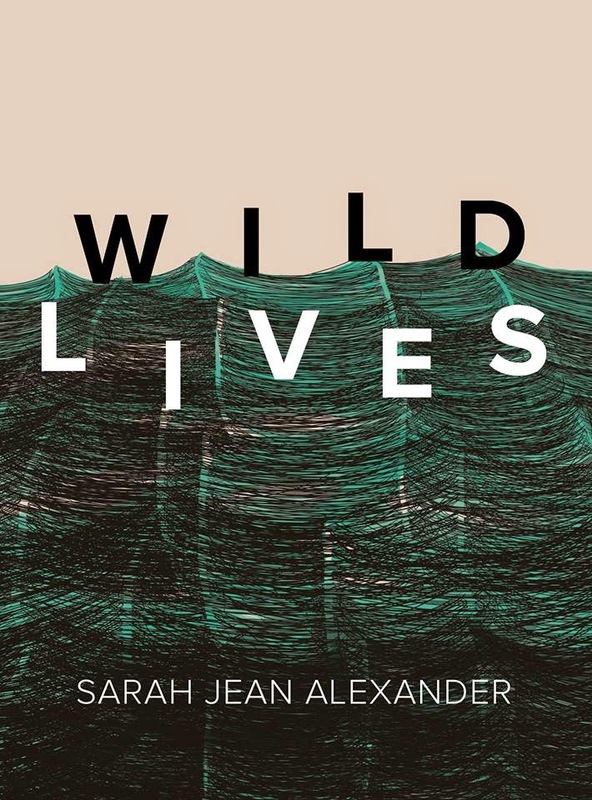 Sarah Jean sent me Wildlives on October 23rd. It was the 137th manuscript that I received. I felt an immediate rush of adrenaline when I saw her name in Submittable, so I took a long lunch & tried to read the whole thing in one sitting. Every poem had me stopping & sighing & taking deeper breaths. I thought it needed some editing. I also thought that I needed to publish it. literally nothing you do matters. something differently of this world. 8. I ordered a torta that I didn’t eat, Sarah Jean got a salad (I think?! ), and then I told Sarah Jean that I wanted to publish her book. She agreed. Later that night, I got to see Mathias read from Wastoid. Overall, It was a pretty beautiful day. 9. Every time I sit down with a manuscript, the first thing I ask myself is, what do I think the author wants the reader to feel when they put this down? As soon as I figure it out, I ask the author if I’m right. 10. When I told Sarah Jean what I thought she wanted, she told me I was right. 11. When I say that Wildlives needed some editing, what I really mean is that we needed to cut some things and reorder some other things to make the book’s argument a little tighter. We ended up cutting about twenty pages & adding fifteen. We isolated “Share Your Fears With Mine” and made it an entire section, because it serves as a perfect anchor for the rest of the book. This took us (/me) about eight months. 12. I don’t wanna tell you what the author wanted. But I think when you read this book, you’re going to be heartbroken. 13. What I like the most about this book is that it’s a completely different style than the earlier stuff I had seen from Sarah Jean. While those earlier pieces are realistic and reserved, Wildlives is surreal and dreamlike. I think a lot of people are going to be surprised by this book. 14. I don’t spend too much time thinking about “Alt Lit” because—like God or Big Foot or Fat Free Ice Cream—I’m not entirely convinced that Alt Lit actually ever existed. What I am sure of, though, is that I accepted Wildlives because it is tender & confessional & emotive. It reminded me of the work of Zachary Schomburg, Paul Eluard, and (early) Anne Waldman. This is not just a book for people who care about that “scene.” It’s a book for anyone who knows what it feels like to be heartbroken and alone and resilient. Basically, it’s a book for everyone. 15. At one point last fall, Sarah Jean published a couple of incredible poems that were more in the realism/personism vein that I’m referencing above. I asked Sarah if she’d be game to pushing Wildlives back a bit and letting me publish another book before it. She decided against this, because she wanted you to have this book now. And in hindsight, I know she’s right. 16. Sarah Jean, I would still do another one/every one of your books, because you are incredible. 17. Sarah Jean and I spent way too long trying to figure out a fun little promotional giveway. 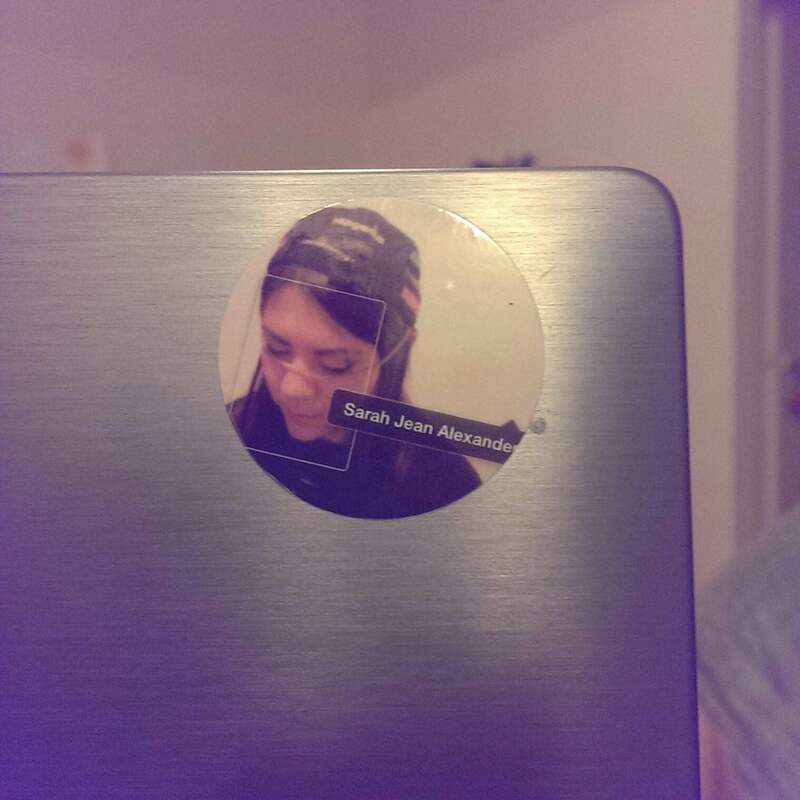 One night, I randomly blurted out “SELFIE STICKERS!” Sarah Jean said “What the hell are selfie stickers?” And that’s how we wound up giving away Selfie Stickers. 18. On the first day alone, Wildlives sold over a hundred preorder copies. So far, we’ve sold copies in about 10 different countries, including England, Germany, Spain, Australia, South Africa, and Malta. 19a. It took me eight weeks and over twenty trips to the post office to get caught up on shipping all the preorders. I was particularly crappy about international orders, which made me realize that I needed a) better distribution; and b) some help with the press. And I got those things. If you live overseas, chances are you can order Wildlives from Amazon.eu and have it at your house in 3 days. 19b. Every preorder copy has been dropped in the mail. If you haven’t received your copy yet, email me at books[a]biglucks[dot]com and I’ll either tell you when I shipped it or I’ll just ship it again from Amazon at no extra charge. 20. Sarah Jean and I have had two-and-a-half “fights” about this book: one about the back cover (I was worried about our timeline), one about the release party venue (I wanted it to be a private affair), and a half-fight about balloons (I mean, traffic). Sarah Jean won every fight because in every instance, she was right. 21. If publishing has taught me anything, it’s to trust and to love and to trust again. 22. We held Sarah Jean’s release reading last Friday. The balloons were beautiful & so was she. It was the best reading I’ve ever seen her give. 23. 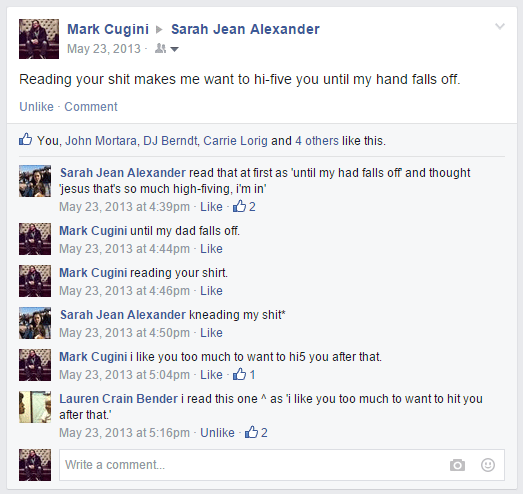 On June 21st, 2013, Sarah Jean was hit by a motorcycle. I will never, ever forget this. 24. I owe so many things to my many people and my greatest anxiety is that I’ll never be able to pay every little miracle back. It’s why I write and why I publish—to make someone feel as if they mean something. 25. If I die tomorrow, at least I’ll have died knowing that I was able to give Sarah Jean (and all of you) this book.